From the genus Dalbergia, rosewood is a tight-grained wood that’s commonly used for creating small-scale craft projects, such as jewelry boxes. Rosewood is a firm favorite among guitar makers due to its oily texture, which allows the fingers to glide across the fret board. In most circumstances the color of rosewood is naturally dark brown. Although the color can't be altered significantly, it is possible to darken it with stain, which can make it closely resemble ebony. Use black leather dye and tung oil to darken rosewood. Lightly sand the rosewood with 150-grit sandpaper. Wipe off the dust with a tack cloth. Create a homemade stain by mixing together 1 part black leather dye with 4 parts tung oil in a bucket. If you’d prefer to have a darker stain, add more dye. Cover plastic, metal or any parts of the piece that you don’t want to dye with masking tape. Make sure it’s securely fixed in place and that there are no open gaps. This will prevent the stain from causing unwanted coloring to these areas. Dip a rag into the stain mixture, blot it onto the rosewood, and rub it in. Let it soak for five minutes, and then wipe off the excess stain with a clean, dry rag. If the shade is lighter than you wanted when it dries, continue adding more layers using the same application method. Brush a thin layer of black leather dye over the top of the stained wood with a soft bristled paintbrush if you want the rosewood to resemble ebony. Don't wipe away the exces,s as the purpose is to make the wood as dark as possible. Wait for it to dry. Wipe a thin layer of tung oil over the top with a rag and wait for it to dry. This will provide a protective coating to prevent the dye from wearing off. Sand down the rosewood with 600-grit sandpaper and then wipe away the dust with a tack cloth. This will smooth out any blotches of stain or oil. 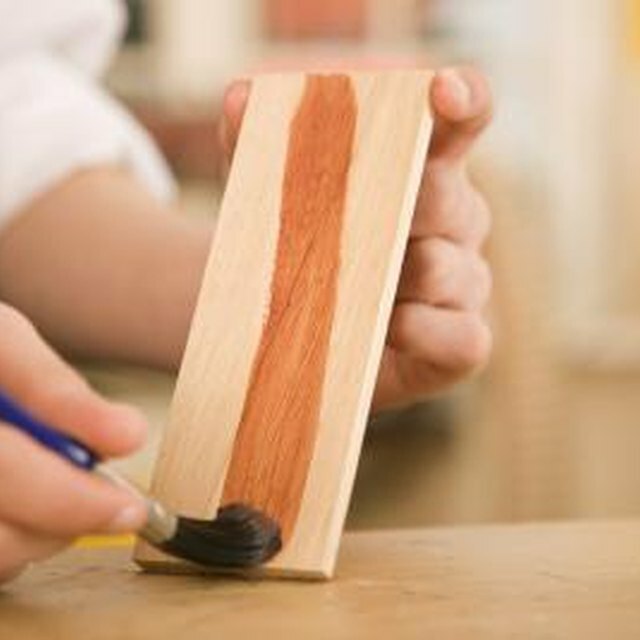 Apply a thin layer of polyurethane varnish with a soft-bristled paintbrush to further protect the rosewood. Use light brush strokes to prevent air bubbles from forming. If you want to restain rosewood, remove the old finish first. Scrub it with a steel wool pad that's been soaked in antique refinisher. Once the finish has been removed, smooth it down with 150-grit sandpaper. Apply the stain, dye and oil outside or in an area that’s been lined with newspaper to protect floors. Speed up drying times by applying the stain outside. If you have to undertake the process indoors, do so in a well-ventilated room.